Birthday's are incredible, fun filled celebrations of life - and Bear's is poking it's head through the door announcing it's imminent arrival (at the end of the month). That being said, I've already started stockpiling gifts (a new collar, a new stuffy, some steak - but shhh don't tell! ).......This year's we've been contemplating a pooch-party to celebrate the fact that Bear will be turning 4. We've started making some really wonderful poochy-friends within the walls of our condo, and it could be an exciting adventure - or an epic mess....all things depending. 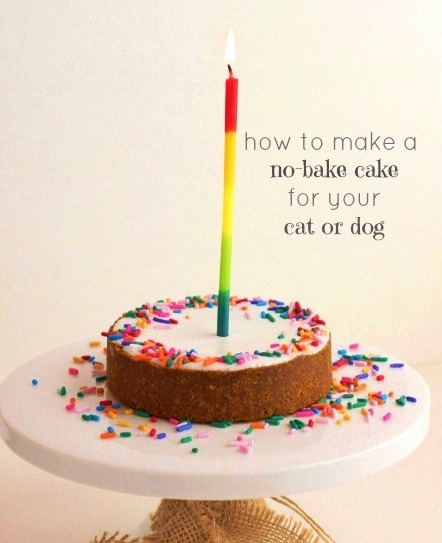 With this possibility firmly in mind, I've started the hunt for the perfect Doggy Birthday Cake recipe. I know that there's always the option to go out an purchase a cake from one of our local pet stores, but I've always enjoyed the warmth and care put into home-made cakes. My journey into dog-cake-making started with Created by Diane who put together a rather yummy sounding No-Bake creation. 1. put dog food into food processor along with peanut butter and pumpkin puree. 2. Pulse until it resembles coarse crumbs and sticks together. 4. Remove from cake pan. Do you and your pooch have any favorite cake recipes? Bark at us and let us know!